Ananka's Diary: Cute . . . or CLONE? Ooh, a clone Walt Disney creepy!! So wrong, yet very very interesting. I think that with discoveries like these for human kind, there comes a great responsibility. If we're given this knowledge, it shouldn't be exploited. Also, there will always be the issue of ethical standards. But I agree, it would be freaky to see a T-rex(maybe a mini version would be better then) or a wooly mammoth, or sabre-tooth in a zoo. I'm not really sure how I feel about cloning. What really is the point of cloning things, anyway? I just find it weird. I think it's a cute mouse. But I don't think I would want to see a woolly mammoth nor a saber tooth tiger. Cloned or not. Cloning is so...wrong. It's like playing God. 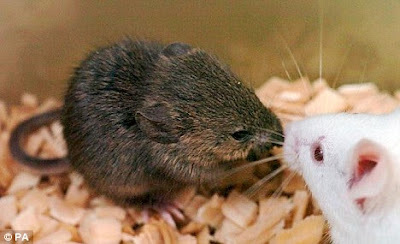 But, uh, you gotta admit, that mouse is CUTE! I agree with Kiel, though. Walt was unique. No one could ever replace him. And having watched Jurrasic park fourteen times over the weekend, I find the thought of a real life Park terrifyingly attractive. Very interesting, Kirsten. P.S. Has anyone heard of Dolly, the cloned sheep? just a little on the freaky side. I think cloning is wrong. I'm sorry to those who think otherwise, but there is only one of everybody. What happened to everyone's different? And it's not for religios reasons (I don't think I believe in God)I just think it's wrong. That would be so cool! Walt would be very pleased to see that his enterprise is slowly taking over the minds of the young. Cloning.... weird, but I can see how there would be lots of religous/moral disputes on how this technology should be used. I think cloning isn't very respectful to human life. It IS cute, but no cuter than a normal mouse. Oh, and Nina, do you mean you're learning how it works, or you're actually doing it? That would be one heck of a biology course. whoa. um i agree w/ Nellie.